As many of my readers know, a few years ago I declared war on aging. I know that biologically my time clock is ticking but I don't think I should have to look old while it ticks. I know I won't look like I'm 25 but I can do all I can to look young for my age and to be as healthy as possible. I have tried many products to arm myself for this battle and I tell all of you about the best of the best that I come in contact with. I expect to have fine lines here and there, and to see the effects of gravity as well. I know that I am not a teenager, so why do I still battle from time to time with acne? Acne is not attractive at any age but especially when it's so unexpected as in women my age. I decided to do a little research to find out what causes acne in middle aged women. The fact is that acne in people over 20 is due to many things, from stress to hormonal changes. Hormonal changes tend to increase oil production on your skin . Starting or stopping birth control, or the dreaded "M" word (menopause) causes hormone imbalances that affect sebum production on the skin. 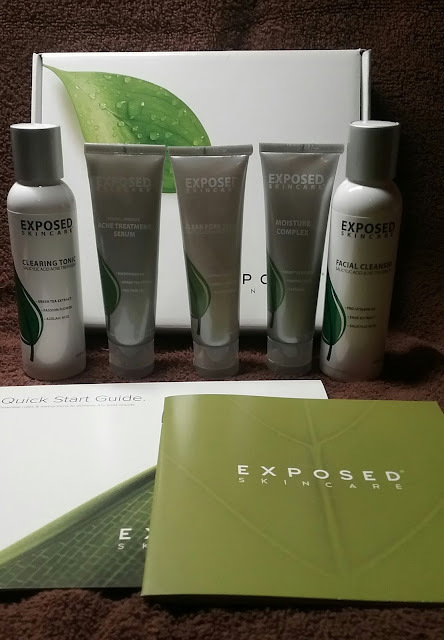 No matter the cause, you can clear your skin using a skin care system I recently had the opportuity to try, Exposed Basic 4-Step Acne Treatment. This system is easy to use, use it morning and night. Keep in mind that less is more. Using too much of the products can cause your acne to worsen. Start off slowly using a small amount of each product. My skin is somewhat sensitive but this acne treatment system hasn't irritated my skin at all. As a matter of fact my skin feels soft and smooth, and looks clearer already. I am really pleased with the results I'm seeing.